Graduated Scale of 150mm (6 inches).Heavy Pattern Body. Adjustable Prism table marked with grooved lines. Eyepiece and Rack pinion fine focusing. - A steel frame mounted on a heavy cast iron base with leveling screws. - Upper end of rod (under test) 900mm length and 5mm dia is clamped by a 3-jaw chuck and the lower end is clamped into the axis of a torsional drum which can be rotated by putting load in the scale pan passing over two frictionless pulley. Hall Effect experiment apparatus To determine the Hall voltage developed across the sample material and to calculate the Hall coefficient and the carrier concentration of the sample material. The performance of interconnects cables, plugs quality and connectors in general have a major influence on the musical performance of an audio system. All Types of Physics Lab Equipments. For viewing slides in available light. We present a well engineered range of physic equipments. 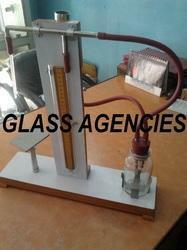 A vast range of physics equipments is available with us. We offer very reasonable prices for these highly advanced physics equipments.